We’ve worked with hundreds of physicians and understand that for them, obtaining medical malpractice insurance can be a burdensome task that neither you nor your staff are ever ready to handle. Let’s face it, insurance coverage is not a desirable thing to shop for, but it is a “must have” for you that will protect your practice and your assets. But it can be costly. So, how do you decide what coverage and premium is right for you? We know physicians sometimes accept medical malpractice insurance coverage from an insurance company, just because it offers the lowest premium. After all, budgets are tight and, most of the time, they don’t think they will experience a claim. However, even though they choose coverage with the lowest premium, will this medical malpractice insurance coverage provide premium savings over time and cover them properly? So, how do you know what’s right for you based on your budget and practice needs? Insurance applications can be tedious to complete and we have found that many physicians skip questions and the remarks section due to lack of time and desire. We know that underwriters review applications objectively by looking for the few pieces of information that would allow them to provide a quote. But, what if there were a way to have the underwriter review your documents on a more personal and subjective manner where your quote is based on additional information you provide and specifically for your needs? 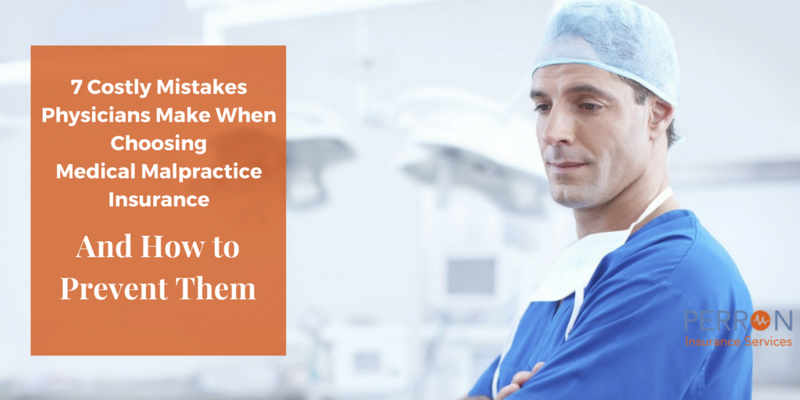 We decided to develop the “7 Costly Mistakes Physicians Make When Choosing Medical Malpractice Insurance and How to Prevent Them” free guide as a tool to help physicians and practice managers make better decisions when buying malpractice insurance coverage. The information provided will show you how to select provide the right, cost effective coverage for your needs.